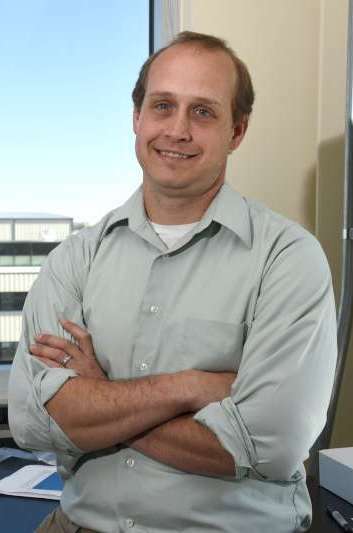 Researcher - Eric Dufek, Ph.D.
Dr. Eric Dufek is Idaho National Laboratory’s energy storage group lead, overseeing 15 research scientists, engineers and interns and coordinating projects and strategic planning in energy storage R&D. He is principal investigator and technical lead on multiple projects related to electrochemical processing and electrolyte development for increased stability and safety in Lithium-ion batteries. He is the lab’s core liaison with the Department of Energy and private sector customers, in charge of energy storage business development. He is active in collaboration with multiple universities, national laboratories and private sector companies. He received his bachelor’s in chemistry from the University of South Dakota and his doctorate in Analytical Chemistry (Electrochemistry) from the University of Wyoming. Before joining INL in 2010 he was a postdoctoral research associate at the University of Utah. “Enabling fast charging – A battery technology gap assessment” Shabbir Ahmed et. al. J. Power Sources, 367 (2017), 250-262. “Enabling fast charging – Vehicle Considerations” Andrew Meintz et. al J. Power Sources, 367 (2017), 216-227. “Enabling fast charging – Battery Thermal Considerations” Matthew Keyser et.al. J. Power Sources, 367 (2017), 228-236. “Phosphoranimines containing cationic N-imidazolinium moieties” John R. Klaehn, Harry W. Rollins, Joshua S. McNally, Navamoney Arulsamy, Eric J. Dufek, Inorganica Chimica Acta (2017), 466, 254-265. “Enhancing Li-ion Battery Safety by Early Detection of Nascent Internal Shorts” S.V. Sazhin, E. J. Dufek, and K.L. Gering, Journal of the Electrochemical Society (2017), 164(1), A6281-A6287. “Morphological Analysis and Synthesis for Understanding Electrode Microstructure Evolution as a Function of Applied Charge/Discharge Cycles” Michael V. Glazoff, Eric J. Dufek and Egor V. Shalashnikov, Applied Physics A (2016), 122, 894. ”Use of phosphoranimines to reduce carbonates in Li-ion battery electrolytes” Eric J. Dufek, John R. Klaehn, Josh S. McNally, Harry W. Rollins, and David K. Jamison Electrochimica Acta (2016), 209, 36-43. “Density impact on performance of composite Si/graphite electrodes” Eric J. Dufek, Michael Picker, and Lucia M. Petkovic Journal of Applied Electrochemistry (2016), 46, 359. “Selective fluorescence detection of Al(III) by dehydration of secondary alcohols in mixed DMSO/Aqueous Media” M. Alaparthi, K Mariappan, E.J. Dufek, M. Hoffman, and A.G. Sykes, RSC Advances (2016), 6, 11295. “Electrodeposition as an alternate method for preparation of environmental samples for iodide by AMS” M.L. Adamic, T.E.Lister, E.J. Dufek, D.D Jenson, J.E. Olson, C. Vockenhuber, M.G. Watrous, Nuclear Instruments and Methods in Physics Research Section B: Beam Interactions with Materials and Atoms (2015), 361, 372. “Unsaturated Phosphazenes as Co-solvents for Lithium-Ion Battery Electrolytes” Mason K. Harrup, Harry W. Rollins, David K. Jamison, Eric J. Dufek, Kevin L. Gering, Thomas A. Luther, Journal of Power Sources (2015), 278, 794. “Fluorinated Phosphazene Co-solvents for Improved Thermal and Safety Performance in Lithium-Ion Battery Electrolytes” Harry W. Rollins, Mason K. Harrup, Eric J. Dufek, David K. Jamison, Sergiy V. Sazhin, Kevin L. Gering, Dayna L. Daubaras, Journal of Power Sources (2014), 263, 66. “Sampling dynamics for pressurized electrochemical cells” Eric J. Dufek, Tedd E. Lister and Simon G. Stone, Journal of Applied Electrochemistry (2014), 44, 849-855. “Aluminum Electroplating on Steel from a Fused Bromide Electrolyte” Prabhat K. Tripathy, Laura A. Wurth, Eric J. Dufek, Tony Y. Gutknecht, Natalie J. Gese, Paula A. Hahn, Steven M. Frank, Guy L. Fredrickson, and J Stephen Herring, Surface and Coatings Technology (2014), 258, 652-663. “Evaluation of the SEI using a multilayer spectroscopic ellipsometry model” Eric J. Dufek, ECS Electrochemistry Letters (2014), 3(11) A108-A111. “Hybrid phosphazene anodes for energy storage applications” Eric J. Dufek, Mark L.Stone, David K. Jamison, Frederick F. Stewart, Kevin L. Gering, Lucia M. Petkovic, Aaron D. Wilson, Mason K. Harrup, Harry W. Rollins, Journal of Power Sources (2014), 267, 347-355. “Chlor-syngas: Coupling of Two Electrochemical Technologies for Production of Commodity Chemicals” Tedd E. Lister and Eric J. Dufek, Energy & Fuels (invited special issue Accelerating Fossil Energy Technology Development), (2013), 27(8), 4244. “Operation of a pressurized system for continuous reduction of CO2 ” Eric J. Dufek, Tedd E. Lister, Simon Stone, and Michael E. McIlwain, Journal of the Electrochemical Society, (2012), 159(9), F514. “Influence of electrolytes and membranes on cell operation for syn-gas production” Eric J. Dufek, Tedd E. Lister and Michael E. McIlwain, Electrochemical and Solid State Letters, (2012), 15(4), B48. “Influence of S contamination on CO2 reduction at Ag electrodes” Eric J. Dufek, Tedd E. Lister, and Michael E. McIlwain, Journal of the Electrochemical Society, (2011), 158(11), B1384. “Bench-Scale Electrochemical System for Generation of CO and Syn-Gas from CO2” Eric J. Dufek, Tedd E. Lister and Michael E. McIlwain, Journal of Applied Electrochemistry, (2011), 41(6), 623. “Competitive surface enhanced Raman scattering assay for the detection of 1,25-dihydroxy Vitamin D” Eric J. Dufek, Michael C. Granger, Tanya Sandrock, Sam L. Legge, Mark Herrman and Marc D. Porter, Analyst, (2010), 135, 2811-2817. “Characterization of Zr(IV)-Phosphonate Thin Films which Inhibit O2 Reduction on AA2024-T3”, Eric J. Dufek and Daniel A. Buttry, Journal of the Electrochemical Society (2009), 156(9), C322-C330. “Inhibition of O2 Reduction on AA2024-T3 Using a Zr(IV)-Octadecyl Phoshonate Coating System”, Eric J. Dufek and Daniel A. Buttry. Electrochemical and Solid State Letters (2008), 11(2), C9-C12. “Dioxygen Reduction Affects Surface Oxide Growth and Dissolution on AA2024-T3”, Eric J. Dufek, Jesse Seegmiller, Reinaldo C. Bazito, and Daniel A. Buttry. Journal of the Electrochemical Society (2007), 154(9) C458-C464. “Syntheses, Characterizations, and Properties of Electronically Perturbed 1,1’-Dimethyl-2,2’-bipyridinium Tetrafluoroborates”, Dong Zhang, Eric J. Dufek, and Edward L. Clennan. Journal of Organic Chemistry (2006), 71(1), 315-319. “Structural and electronic features important to nπ*-ππ* inversion sensors: synthesis, luminescence, and electrochemical properties of sulfur and chlorine-containing macrocycles. Part 3.” Mariappan Kadarkaraisamy, Eric Dufek, Desire Lone Elk and Andrew G. Sykes. Tetrahedron (2005), 61(2), 479-484. "Rotationally-Induced Hydrodynamics: Fundamentals and Applications to High Speed Bioassays", Gufeng Wang, Jeremy D. Driskell, April A. Hill, Eric J. Dufek, Robert J. Lipert and Marc D. Porter, Annual Review of Analytical Chemistry (2010), 3 (1), 387-407. “Enhancing Li-ion Battery Safety by Early Detection of Nascent Internal Shorts” Sergiy V. Sazhin, Eric J. Dufek and Kevin L. Gering, Electrochemical Society Transactions (2016), 73(1), 161-178. "Electrochemical Systems for Production of Syngas and Co-Products" Tedd E. Lister, Eric J. Dufek and Simon G. Stone Electrochemical Society Transactions (2013). "Bench-scale electrochemical production of synthesis gas" Eric J. Dufek, Tedd E. Lister and Michael E. McIlwain 2012 AIChE Annual Meeting Conference Proceedings (2012). "Enhanced generation of syn-gas from the electroreduction of CO2 at elevated pressure" Eric J. Dufek, Tedd E. Lister and Michael E. McIlwain Preprints of Symposia-American Chemical Society, Division of Fuel Chemistry (2012), 57(1), 234-235. ​Klaehn, J. R.; Dufek, E. J.; Rollins, H. W.; Harrup, M. K.; Gering, K. L.; “Electrolyte Solutions Including A Phosphoranimine Compound, And Energy Storage Devices Including Same,” US Patent 9,761,910. Lister, Tedd, Parkman, Jacob, Diaz Aldana, Luis A, Clark, Gemma, Dufek, Eric J., Keller, Philip “Electrochemistry Enabled Recovery of Value Metals from Electronics” – US Patent 9,777,346. “Impacts of Fast Charging at the Cell and Vehicle Level” Eric J. Dufek, Matt Shirk, Randy Bewley and Ryan Jackman, 2016 Battery Show (Sept. 13, 2016), Novi, MI. "Battery Life Modeling-Prediction vs. Results" Jon P. Christophersen, Eric J. Dufek, and Chinh D. Ho, 2015 Advanced Automotive Battery Conference (June 15-19), Detroit, MI. "Small to Large Scale Energy Storage, Monitoring, and Security" Eric J. Dufek, Federal Laboratory Symposium (Mar. 24-26), College Park, MD. "Bench-Scale Electrochemical Production of Synthesis Gas", Eric J. Dufek, Tedd E. Lister and Michael E. McIlwain, 2012 AIChE Annual Meeting (Oct. 2012), Pittsburgh, PA. Surface enhanced Raman scattering as a readout strategy for immunodetection", Marc D. Porter and Eric J. Dufek, Invited Presentation. Particles 2010 (May 22-25) Orlando, FL. "Difficulty and Techniques for Assessing Battery State of Health" Chris Orendorff, Eric J. Dufek, Josh Lamb, Larry Juang and Jon Christophersen, Stranded Energy Technical Workshop (Dec. 2015) Chicago, IL. "Phosphorus-containing Electrolytes – Expansion to include Phosphoranimines for Li-ion Batteries", Eric J. Dufek, John R. Klaehn, Josh S. McNally and Harry W. Rollins, 228th meeting of the Electrochemical Society (Oct. 2015) Phoenix, AZ. "Battery Life Modeling-Prediction vs. Results", Jon P. Christophersen, Eric J. Dufek and Chinh D. Ho, 2015 Advanced Automotive Battery Conference (June 2015) Detroit, MI. "Use of complimentary methods to evaluate energy storage interfaces", Eric J. Dufek, Lucia M. Petkovic, Harry W. Rollins, and John R. Klaehn, 248th National meeting of the American Chemical Society (Aug. 2014) San Francisco, CA. "Correlating electrochemical and spectroscopic ellipsometry signals to evaluate energy storage interfaces", Eric J. Dufek and Lucia M. Petkovic, 224th meeting of the Electrochemical Society (Oct. 2013) San Franscisco, CA. "Morphological analysis for the evaluation of electrode structures", Eric J. Dufek, Michael V. Glazoff, and Kevin L. Gering, 224th meeting of the Electrochemical Society (Oct. 2013) San Franscisco, CA. "Electrochemical Systems for Production of Syngas and Co-products", Tedd E. Lister, Eric J. Dufek and Simon G. Stone, 224th meeting of the Electrochemical Society (Oct. 2013) San Francisco, CA. "Integrated Carbon-Reduced Battery Chemistries for Safer Alternative Li-ion Cells", Mason Harrup, Eric J. Dufek and Kevin L. Gering, accepted for the 224th meeting of the Electrochemical Society (Oct. 2013) San Francisco, CA. "Enhanced generation of syn-gas from the electroreduction of CO2 at elevated pressure", Eric J. Dufek, Tedd E. Lister, and Michael E. McIlwain, 243rd ACS National Meeting (Mar. 2012), San Diego, CA. "Implications associated with S contamination for the production of syn-gas from CO2 reduction", Eric J. Dufek, Tedd E. Lister and Michael E. McIlwain, 220th meeting of the Electrochemical Society (Oct. 2011), Boston, MA. "The influence of particle-particle plasmonic interactions occurring during surface-enhanced Raman scattering sandwich immunoassays", Eric J. Dufek, Alexis C. Crawford, Michael C. Granger and Marc D. Porter, 240th ACS National Meeting (Aug. 2010), Boston, MA. "Increasing heterogeneous immunoassay sensitivity through plasmonic optimization of the surface enhanced Raman scattering of gold nanoparticle labels" Eric J. Dufek, Jeremy D. Driskell, Robert J. Lipert and Marc D. Porter, 237th ACS National Meeting (Mar. 2009), Salt Lake City, UT. "Influence of Zr-Phosphonate Multilayers on O2 Reduction and Corrosion on AA2024-T3", Eric J. Dufek and Daniel A. Buttry, 2007 Tri-service Corrosion Conference (Dec. 2007), Denver, CO.
"Influence of Zr-phosphonate Multilayers on Dioxygen Reduction and Corrosion on AA2024-T3", Eric J. Dufek and Daniel A. Buttry, 213th meeting of the Electrochemical Society (Oct. 2007), Washington, DC. "Inhibition of O2 reduction through the use of Zr-phosphonate treatments", Eric J. Dufek and Daniel A. Buttry, 212th meeting of the Electrochemical Society (May 2007), Chicago, IL. "Imaging of the adsorption of decyl phosphonate to AA2024", Eric J. Dufek and Daniel A. Buttry, 2006 University of Wyoming Graduate School Symposium, (April 2006), Laramie, WY. "Imaging tools and thin film coatings for corrosion prevention in aluminum alloys", Eric J. Dufek, Jesse Seegmiller, Reinaldo C. Bazito, Daniel A. Buttry, 2005 Tri-service Corrosion Conference (Nov. 2005) Orlando, FL. "Understanding Electrode-Electrolyte Solution Interactions between TiO2 Nanotube Electrode and Nonaqueous Electrolytes for Sodium-ion Batteries” K. Smith, D. Karsann, R. Parrish, R. Hunt, E. J. Dufek, G. Kamath, S. Sankaranarayanan, H. Xiong, 18th International Meeting on Lithium Batteries, June 23, 2016, Chicago, IL. “Enhancing Li-ion Battery Safety by Early Detection of Nascent Internal Shorts” S.V. Sazhin, E.J. Dufek, K.L. Gering, 18th International Meeting on Lithium Batteries, June 21, 2016, Chicago, IL. “Phosphoranimine Electrolytes for Alkali-ion Batteries” E. J. Dufek, J.R. Klaehn, J.S. McNally, H.W. Rollins, 18th International Meeting on Lithium Batteries, June 20, 2016, Chicago, IL. "Investigation of CO2-H2O Reduction Systems: Production of Syn-gas Mixtures", Tedd E. Lister, Eric J. Dufek and Michael E. McIlwain, 220th meeting of the Electrochemical Society (Oct. 2011) Boston, MA. "Bench-Scale System for Electrochemical Reduction of CO2", Eric J. Dufek, Tedd E. Lister and Michael E. McIlwain, Future Directions in CO2 Conversion Chemistry, Oct. 21, 2010, Princeton, NJ. "Dioxygen reduction and its inhibition using metal-phosphonate adlayers on AA2024-T3", Eric J. Dufek and Daniel A. Buttry, 2010 Gordon Research Symposium on Electrochemistry, Jan. 9-10, 2010. "Enhancing the sensitivity of immunoassays through plasmonic optimization of surface enhanced Raman scattering of gold nanoparticle labels", Eric J. Dufek, Jeremy D. Driskell, Robert J. Lipert, and Marc D. Porter, 2008 nanoUtah Conference, Oct. 16-17, 2008. "Reduction and luminescence chemistry of 1,8-anthraquinone-18-crown-5", Mariappan Kadarkaraisamy, Eric Dufek, and Andrew G. Sykes, t 233rd ACS National Meeting (March 2007), Chicago, IL. "Use of Zr-phosphonate coatings to inhibit dioxygen reduction on AA2024-T3", Eric J. Dufek and Daniel A. Buttry, 2007 Gordon Conference on Electrochemistry, Ventura, CA. "Reduction and luminescence chemistry of 1,8-anthraquinone-18-crown-5", Mariappan Kadarkaraisamy, Eric Dufek, and Andrew G. Sykes, Spring 2004 National Conference for Undergraduate Research (April 2004), Indianapolis, IN. "Electrochemical Performance Testing" Matthew G. Shirk, Eric J. Dufek, Jon P. Christophersen, Christopher J. Michelbacher, Sergiy V. Sazhin, Lee K. Walker. 2015 DOE Vehicle Technologies Program Annual Report. "Diagnostic Testing and Analysis Toward Understanding Aging Mechanisms and Related Path Dependence" Kevin L. Gering, David K. Jamison, Bor Yann Liaw, Christopher J. Michelbacher, Matthieu Dubarry, Sergiy V. Sazhin, Cyril Truchot, Eric J. Dufek. 2013 DOE Vehicle Technologies Program Annual Merit Review, May 14, 2013. "Novel Phosphazene Compounds for Enhancing Stability and Safety of Lithium-ion Batteries" Kevin L. Gering, Michael T. Bension, Eric J. Dufek, Mason K. Harrup, Harry W. Rollins, Sergiy V. Sazhin, Fred F. Stewart, Mark L. Stone. 2013 DOE Vehicle Technologies Program Annual Merit Review, May 14, 2013.